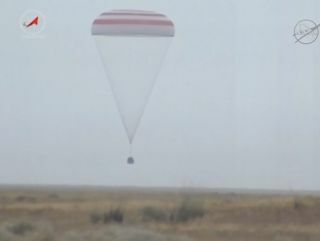 A Soyuz spacecraft carrying cosmonaut Gennady Padalka, the European Space Agency’s Andreas Mogensen and Kazakhstan’s Aidyn Aimbetov lands in Kazakhstan on Sept. 11, 2015. Padalka came up in March with fellow cosmonaut Mikhail Kornienko and NASA's Scott Kelly, both of whom are now halfway through an unprecedented yearlong orbital mission. Researchers are studying how Kornienko and Kelly adapt physiologically and psychologically to long-duration spaceflight, in an attempt to pave the way for crewed journeys to Mars and other distant destinations. The 12-month mission necessitated the temporarily crowded conditions on the space station. Soyuz capsules are certified to remain in space for just 6 months, so the vehicle that brought Padalka, Kornienko and Kelly up cannot be used to take the latter two down next March. Mogensen and Aimbetov therefore launched to the orbiting lab — along with cosmonaut Sergey Volkov, who is staying aboard until next March — primarily to provide Kornienko and Kelly with a vehicle that will take them home. Incidentally, Aimbetov was not originally scheduled to go to space this month. His spot on the brief mission was supposed to be filled by English singer Sarah Brightman, who was reportedly prepared to pay about $50 million for her orbital experience. But Brightman backed out in May, citing personal reasons. The people still aboard the International Space Station in addition to Kornienko, Kelly and Volkov are NASA astronaut Kjell Lindgren, Japan's Kimiya Yui and cosmonaut Oleg Kononenko.